After much searching to find available weaner pigs (little pigs that have been recently weaned), I finally brought home seven bright little pigs from a farm about 70 kms north west of here. 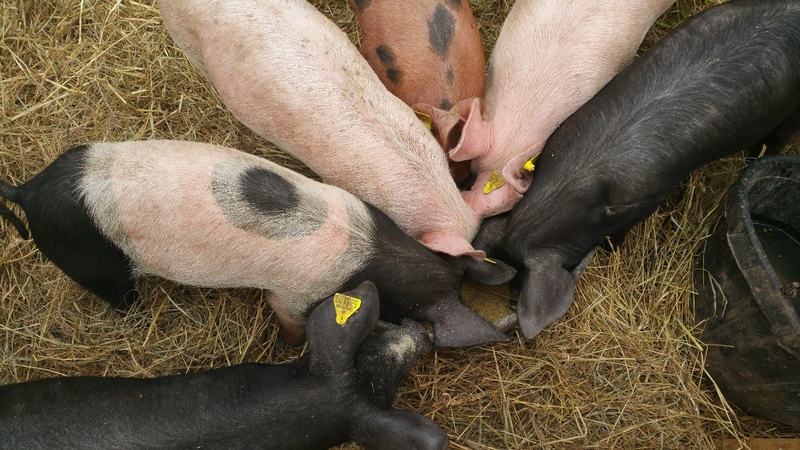 The farm had a good reputation and the piglets were of mixed heritage breed (Yorkshire, Large Black and Tamworth). Nice pigs! But they seemed determined to break out of whatever place in which I put them. At first they needed to stay in a pen in the barn because of the deluge of rain outside (they wouldn’t have minded the water and mud but I minded!) I had a little wooden pen ready but they exploited every weakness in it and delighted in getting out and terrorizing the chickens and goats. They were capable of squeezing through gaps that looked to be about half their size and one even flung itself over a rail nearly twice its height. One writer described piglets as “pretty much a cylinder of solid muscle. They’re incredibly strong and extremely fast over short distances.” (Brent Preston). I certainly found that to be true! After two days of continually adding to the pen, I finally had them contained and got to work building the electric fence training yard. While I was getting that ready, they began digging under the side of their pen forcing me to drive stakes deep down to slow them down while I got the outdoor training pen finished. The training pen was finally ready and its electric fence was “hot” with about 4,000 volts running through it. Once in there, the little guys did not behave as they were supposed to; I suppose they hadn’t read the book that I (and last year’s piglets) had read. Yes, they hated the shocks from touching the fence and gave loud squeals. But, instead of staying away from it after one or two hits like they were supposed to, they continually tested it. And then they began rooting and throwing dirt up against the fence. I didn’t sleep much that night, fearing the worst, but was relieved in the morning to find them all still in the field. However, they must not have slept much either but had been busy rooting around much of the perimeter of the field and had started pushing soil up onto the lower wires of the electric fence. We got them back into the barn into the “secure” pen but came to the conclusion that we were not able to keep them. 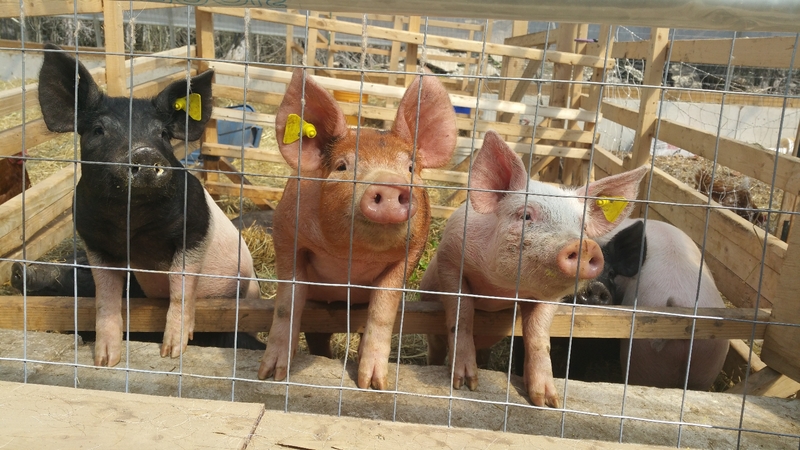 They had already defeated the electric fencing that had worked so well with last year’s pigs and, without strong and secure perimeter fencing, the risk of them breaking out into the neighbour’s garden or onto the road was too great. An electric fence is only a psychological barrier, not really a physical barrier. So, we decided to take them to the auction. We will miss having delicious pork for our own use and for sale but it seems to be a wise (Sheila says a VERY wise) decision to wait to raise pigs until we have better infrastructure for them. In the meantime, it will be good to be able to focus more on the goats and chickens this summer. They seem to like it here and are not always trying to break out. It looks like they are trying to be cute but, in reality, the little gangsters are casing out the wire to see where they can break out again! Oh dear! But it’s sounds like you made th right decision and will have a lead stressful summer not having to play “capture the piggies” all the time. I guess good farming is knowing your limits! Oh this made me laugh! Thanks for sharing the humour along with the challenge!